After fencing at least 500 gold in stolen items, meet with S'Krivva to receive this mission. Travel to Anvil and steal the recommendation letter. Have a new recommendation letter forged. Sneak into the Imperial Legion Offices to seal the letter with the official seal. Deliver the letter to Countess Millona Umbranox. Take the "Transfer Orders" to Hieronymus Lex. Talk to S'Krivva in Bravil. She tells you that Hieronymus Lex is causing problems and that the Gray Fox would like him reassigned so that he can protect Countess Umbranox of Anvil instead of persecuting the Thieves Guild. She also explains that for some unknown reason the Gray Fox recently put the Countess under his personal protection. Anvil is in need of a new Captain of the Guard; your job is to replace the list of recommended candidates in Steward Dairihill's desk in Castle Anvil with a forged one that recommends Lex. Travel to Anvil and speak with a beggar to learn that Dairihill's desk is in the private quarters of the castle and to get some ideas on how to infiltrate it. The beggar will suggest talking to the blacksmith. Orrin, the blacksmith at the castle's smithy who turns out to be a guild member, will show you a secret passage that will get you into the castle's private quarters. When you get to the end of the passageway, be cautious, as there is a guard that frequently patrols this area at all times of the day and night, and Dairihill is also often found walking about. Wait till after 1 am and Dairihill will be out of the room. To open the hidden door at the end of the passage, there is a white pillar to the left of the door. Sneak to Dairihill's desk, which is in a locked room to the left and steal the letter, then return through the secret passage. Ask a beggar again for directions to a forger known only as "A Stranger" who lives in an Abandoned House near the Anvil Mages Guild Hall. The Stranger tends to wander, so use the map compass, as it is less ambiguous. Once you locate the Stranger he will agree to forge a new letter for you, but you'll need to wait a day. He spends part of his day in the Castle Anvil audience chamber, and he will not want to speak about forgery while he is there. It won't even be available as a topic. Instead, try to meet him later in the evening at his home. When a day has passed go back to the Stranger and pay him 500 gold to get the new letter. 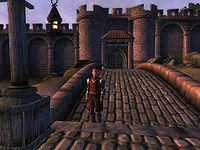 Next, head to the Imperial City and break into the Imperial Legion Offices located in the Prison District. There are several ways to get into the office you want (directly from outside, from the dining hall (the leftmost door labeled 'Imperial Legion Office'), or from the basement, accessible from the dining hall). The seal for the letter is on top of the desk (just activate it to proceed), although it can be knocked off and be somewhat tricky to find. The chest next to the desk contains some high-quality random loot depending on your level (as much as one enchanted weapon, two unenchanted weapons, one enchanted armor, and two unenchanted armor). These items will be marked as stolen, and fencing them is likely to satisfy any further need to do Independent Thievery. Once the letter is sealed, deliver it to Countess Millona Umbranox in Anvil. She'll decide Hieronymus Lex is the man for the job and ask you to deliver the good news to him. She also mentions you can collect your courier's tip (20 gold) from Dairihill (who will not be very happy). Deliver the "Transfer Orders" to Lex, who can be found stopping for lunch at the South Watch Tower in the Temple District around noon, or in the evening around 7pm at The Bloated Float in the Waterfront. After assuring you he knows who's behind this, he resigns himself to the position and makes his way to Anvil, where he puts on the town guard armor and starts his rounds. Finally, return to S'Krivva for your 1000 gold reward (500 plus your cost for the forgery) and advancement to Shadowfoot rank. You'll also have Orrin the blacksmith available as a new fence. S'Krivva will have no more jobs for you but mentions the Gray Fox himself may contact you soon. * These NPCs do not exist in-game. † This NPC is marked as essential until the quest ends. If you speak to Dairihill after you get back with the sealed, forged letter, she'll almost blow up at you, but offer to handle the matter. If you turn the letter over to her, she pays you a 20 gold tip, then stashes the letter in her desk just like the original recommendation letter. You will have to steal the letter back from her to finish the quest. If you really feel like adding insult to injury, speak to Dairihill again after the Countess has given you Lex's transfer orders. You'll get a 20 gold tip from Dairihill, at the Countess' insistence. Make sure you grab the Nirnroot plant from the room behind Dairihill's office. After you complete this quest, a special edition of the Black Horse Courier is published: New Watch Captain Named. In the list of possible candidates, Audens Avidius will be mentioned whether you've completed the Imperial Corruption quest or not, which is unusual if the man is currently imprisoned or killed. Not so unusual is the noted reason why Countess Umbranox should disqualify him from selection: questionable morals. The Legion Commander's desk in this quest is the same desk used in the Dark Brotherhood quest Permanent Retirement. If you have completed that quest (and got the bonus), Adamus Phillida's finger will still be in the desk. You can take the finger back if you wish, although doing so is not recommended: the finger is a quest item that can never be dropped, and picking it up will trigger an update for the Permanent Retirement quest. After you show the transfer orders to Lex, he will behave like an Anvil guard (e.g. with Knights of the Nine installed he will talk about the "Anvil Chapel Attack") even if he is still wearing his Imperial City Armor. Lex will also lose his "essential" flag. Unlike an Anvil Guard however, Lex will still remain 15 levels above your own. An achievement will be unlocked upon being promoted to Shadowfoot. You may have this quest entered into your journal before S'Krivva gives it to you. This could happen by talking to Wretched Aia in Bravil before you have sold the requisite 500 coins of fenced goods, and asking her "Where is S'Krivva?" If you try to speak to A Stranger earlier in the day than when you first spoke to him, he will brush you away saying "Don't bother me", even if it's more than 24 hours later. You may speak to him at the same hour or later in the day than when you first spoke to him. If in doubt, wait until 11pm to speak to him. Another possibility is to enter player.SetStage 00036334 40 in the console. After finishing this quest, proceed directly to the Imperial City and wait (sleep) for the messenger from the Gray Fox. The A.I. of the messengers seeking you is buggy, and you may have trouble finding them later if you travel to other cities instead. ? If you have activated the Turning a Blind Eye quest bug, the Stranger may not be in the Abandoned House in Anvil. If you cannot find the Stranger, check to see whether Turning a Blind Eye is listed as an active quest. If so, you probably need to complete that quest before you can progress in Taking Care of Lex. Be sure, however, to come back and complete the remaining Thieves Guild quests in the correct order, otherwise you will trigger a game-breaking glitch during The Ultimate Heist. When returning to S'Krivva for your reward, the quest compass may point to the Lonely Suitor Lodge even if S'Krivva is at home. Wait until her house is unlocked and visit her there to receive your reward. ? If you kill any of the NPCs in the Blood Price list before the quest is over and return to S'Krivva to pay the money, she will promote you even though the quest is not complete. ? 5 A beggar told me I could find S'krivva at the Lonely Suitor Lodge. 6 I have learned that Dairihill's office is in the castle's private quarters, which is off limits. I should look for an indirect way to get in there. First, I steal the letter from steward Dairihill's desk in Castle Anvil. Then get a forgery made. I have to find and pay for my own forger. Then seal it with the Imperial Watch seal from the legion commander's desk in the Imperial City. Dairihill cannot be trusted to deliver the letter. I must personally deliver the forged letter to Countess Umbranox of Anvil. I will be paid 500 gold, plus the cost of the forgery. 12 A beggar told me that there may be secret ways in the castle. I am supposed to find the blacksmith. I'm not really sure why. 13 Orrin has shown me a secret passage within the walls of Castle Anvil. It should let me get closer to Dairihill's office without being seen by the castle guards. 15 My sources tell me that there is a master forger in Anvil. He is known only as The Stranger. He lives in a house by the Mages Guild. 20 I have the letter. Now I need to find a forger. 30 I delivered the letter to The Stranger. He said to return in a day and he would have the new letter ready. It's going to cost 500 gold coins. 40 The Stranger has forged a new letter for me. Now I have to go to the Imperial Legion compound in the Imperial City. I have to seal the letter using the official seal of the Legion Commander. 50 I've sealed the letter with the Legion Commander's seal. Now I must deliver it to Countess Umbranox personally. I will take on the role of courier. 80 Countess Umbranox has given me her response. Now I need to deliver it to Hieronymus Lex. The look on his face should be priceless. 85 Hieronymus Lex was shocked to learn he had been reassigned. Now the Thieves Guild will be safe from his persecution. All I have to do is get back to S'krivva to collect my reward. 90 Finishes quest S'krivva thanked me for my help in this delicate matter. Hieronymus Lex will no longer be a threat to the Thieves Guild or the Gray Fox. 70 I have killed someone while trying to get Hieronymus Lex reassigned to Castle Anvil. I've been warned that I'll have to pay a blood price of 1000 gold per murder if I want to stay in the Thieves Guild. I can pay S'krivva. 71 S'krivva has kicked me out of the Thieves Guild because I killed someone while trying to get the letter forged and replaced. I'll have to pay the blood price of 1000 gold per murder to be let back in. I can pay S'krivva. 75 Finishes quest S'krivva has readmitted me to the Thieves Guild. Of course I had to pay the blood price first. It is possible to use the console to advance through the quest by entering setstage TG07Lex stage, where stage is the number of the stage you wish to complete. It is not possible to un-complete (i.e. go back) quest stages. See SetStage for more information. This page was last modified on 18 February 2017, at 04:17.